Back in the spring of 2010, before Chick Lit Central was even established as a blog, I won my first book giveaway. The prize was The Brightest Star in the Sky by Marian Keyes. The person giving out this prize was Lydia Laceby, owner of Novel Escapes. (Oddly enough, there's a character named Lydia in the book who has become one of my favorites from a Marian Keyes novel.) After I had won the prize, we stayed in touch via e-mail and she helped me feel better about CLC not gathering enough interest in the beginning. She gave me tips on how to build an audience and told me about a website where I could mention my giveaways. Little did I know, she was writing her own novel, and it has now been published. And of course, it's chick lit! Naturally, I reached out to her as soon as I found out about her book, as I knew I just HAD to feature her at CLC. 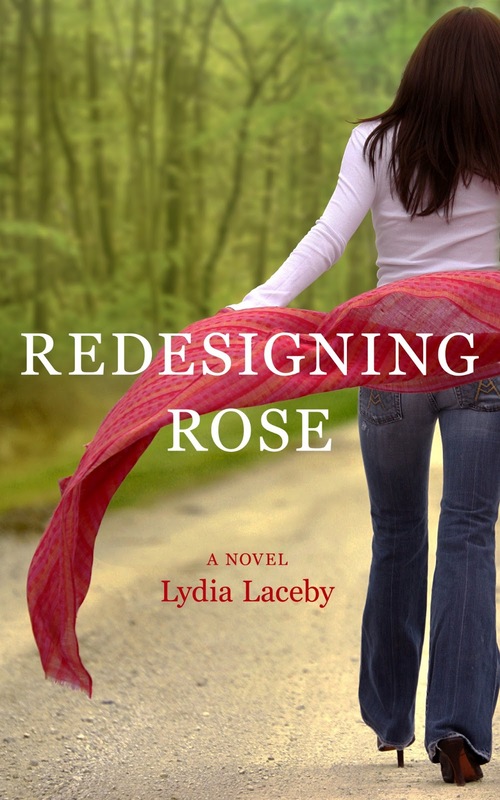 Lydia's debut novel, Redesigning Rose, is about a woman who has to rebuild her life after finding out that her husband was lying to her. Thanks to the help of a newfound friend, she discovers new truths about herself. All I know so far is that if Samantha Stroh Bailey loved Lydia's novel, then it's bound to be a hit! Since Lydia and I met because of our love for books, I felt it was only fitting to theme her "This or That" questions around the topic of books and reading! And not only does she give away books at her own blog, but she's also sharing TWO signed paperbacks of Redesigning Rose with some lucky readers in the US, Canada and/or UK. 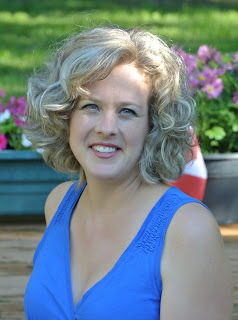 When Lydia isn't reading or writing (or writing about reading), she knits cute baby hats, would pick cheese over chocolate–if she had to choose–and regularly cheats on her allergy free diet. You can find Lydia at her website (where there's also a sneak peek of chapter one), Facebook and Twitter. E-reader! Not only do I read on my commute to work, but I cart a book around in my purse whenever I leave the house. Since acquiring my e-reader, I'm thrilled I no longer fund my chiropractor’s annual vacations by traipsing around with an extra book in my bag whenever I think I might finish the one I'm reading. And not only that, but sometimes the second book I selected isn't quite what I feel like reading and with my e-reader I always have plenty of options. Babysitters Club or Sweet Valley High? Sweet Valley High! I have no words for how much I loved that series! At a crowded event or in a coffeeshop? A coffee shop is my thing. I’m not a huge fan of crowds and love a more quiet atmosphere – maybe because it's much more conducive to reading. Get from the library or buy from the store? I heart buying books from the store so I can give them a permanent home on my shelves. Mystery – unless it’s Lord of the Rings or Game of Thrones. Before I latched onto chick lit, I read mostly mystery or thrillers, particularly Stephen King, Dean Koontz, James Patterson, Jeffrey Deaver, and Patricia Cornwall. Curious George. I've always been pretty curious, and ever since I began writing in earnest my wondering about the world has quadrupled. In addition to asking "what if" about almost every situation I encounter, see, or imagine, I also ask why. Why? Why? Why? My poor husband. Keep on shelves or give away? Book club or read on your own? Reading on my own seems to be my way these days. Every book club I ever belonged to only talked about the book for all of five minutes before the gossip began. It’s not that I didn't enjoy the chit chat, but I found I’d rather hang out with friends without the pressure to read something on a deadline, which I now do constantly with Novel Escapes. Thanks to Lydia for sharing her love of books with us and her debut novel with our readers. 1.Please tell us: Do you prefer an e-reader or a printed book? US/Canada/UK only. Giveaway ends June 23rd at midnight EST. I prefer a printed book. I love the way books smell and the crisp sound a new book makes when opened for the 1st time. At home, I love a printed book. However, I have my kindle loaded on my kindle, iphone and ipad... just in case I am without a book. Hard to say. I love the immediate gratification of the instant purchase, but nothing beats holding a book. I enjoy both real books and e-books.I love being about to 'cart' around dozens of books because I never know what I will be in the mood for. But I love owning my favourite books and books by my favourite authors. I will post this on Facebook. In the interest of full disclosure, I was in a course a number of years ago with Lydia and have not seen her since the end of that coures. I am so excited for her success! I love my Kindle and my iPad so definitely ebooks. Overall I like e books since I love my nook and i no longer have to tote around heavy books in my purse anymore. But there is nothing like the feel of a fresh paperback book in your hands....esp for summer reading by the pool! I love the feel of books, but the conveince of e books is to nice! I already follow this blog, member of fb group, and follow on Twitter and pinterest. I tend to go back and fourth. I read both, it also depends what I can get on my ereader from the library and the prices. I follow your blog and on FB and pinterest. 1. I definitely prefer printed books but I love how cheap some e-reader books are. I enjoy both print books & books on my e-reader. I have fallen in love with my e-reader. I can have so many books ready to be read whever I am. i still get some printed books, though. Although I have a Kindle, I much prefer a printed book over an e-book. I love to hold the actual book in my hands, smell the paper and admire the front and back covers. In addition, it’s great to thumb easily back through the novel as I write my review. Chick Lit has become my favorite genre over any other. From the first time I ever read a chick lit novel, I have been totally hooked. I’m so pleased to see how well it has become a really popular genre with so many delightfully talented authors penning such fabulous novels. I rub my hands together in glee whenever I see a new one on the shelf. Lydia Laceby, you are such a pretty lady and I am so hoping to be a lucky winner of this novel. It sounds soooo good! Thanks for the generous giveaway. E-reading is great but once in a while it's nice to hold an old fashioned book. I follow you on facebook and twitter. Tweeted the giveaway. Follow blog via email/GFC. Follow on Twitter. In the group on FB. I love printed books. Don't own an e-reader. I love my signed book collection! But I also love the ease of an ereader! Although I have 3 eReaders loaded with books, I still prefer printed books. Maybe when I whittle down my printed collection, I will change. I do like eReaders for traveling though. I used to be a die-hard printed book only kind of gal. But lately I've come to see and appreciate the appeal of the e-reader. My Nook goes with me to the gym and I can knock out quite a few chapters everyday on the treadmill or elliptical because you can make the font big enough to see from afar. I like both but I much prefer my ereader because it allows me to read anywhere at any time. It definitely came in handy during late night feedings...well, any time I give the baby a bottle, or have to fold laundry, or do anything that requires my hands. I follow blog, twitter, facebook, pinterest! I prefer a printed book. There is just something about holding a book; however, I am trying to get with new trend and read more ebooks. I do find I read an ebook MUCH faster. I prefer print. There's something about a real book in my hands that just can't be replaced. I enjoy both ebooks and printed books. I follow you on facebook and twitter. I prefer a printed book. I following you with GFC and on FB,Tweeter and Printerest. Thank you for this great giveaway. Sounds interesting...thanks for the giveaway. -I prefer to read a paper book. Thanks for participating and sharing your thoughts on printed vs. e-books. Thanks to Lydia for visiting with us and sharing her book with our winners. Congrats to Tiffany Drew and Sheena!